The relatively tiny body of a newborn sperm whale has washed up in the Western Isles, prompting researchers to believe females of the awe-inspiring species could be swimming in Scottish waters. 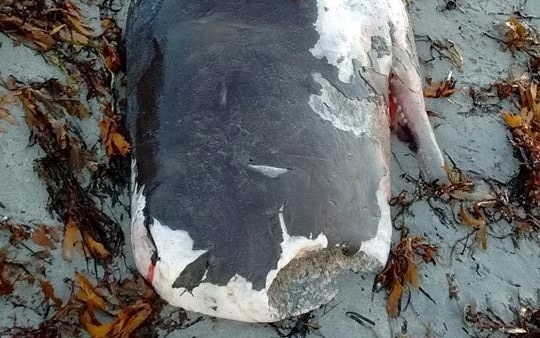 Scientists working for the Scottish Marine Animal Strandings Scheme (SMASS) were called to South Uist this week after receiving reports of the “very rare stranding”. Working with local volunteers, it was established the animal had died either before or during birth, as part of its umbilical chord was still attached. At just 11ft in length, the neonatal carcass will provide scientists with important insight into the anatomy of infant sperm whales, which can grow up to 67ft long and weigh as much as 57 tonnes when fully grown. The baby animal was around 11ft long. A spokesman for SMASS said: “The reason why this is so unusual is, whilst male sperm whales are known to do large migrations and are frequently visitors to the waters around the UK, female sperm whales usually remain in temperate and tropical waters mainly below 50 degrees latitude. “There is only one confirmed report of a female sperm whale stranding on any of the British Isles – this was a juvenile that stranded in Cornwall in July 2016. “This case of a neonatal calf, found in reasonably fresh condition, suggests its mum must have been close to the coast of the Western Isles. After carrying out their autopsy, the SMASS researchers believe the young whale never had the chance to take its first breath. The spokesman added: “The lungs gave us some vital information – they sank like a rock in water, showing they had never been inflated and indicated that this animal had never taken a breath. “It was either aborted, stillborn or died during the birth process. 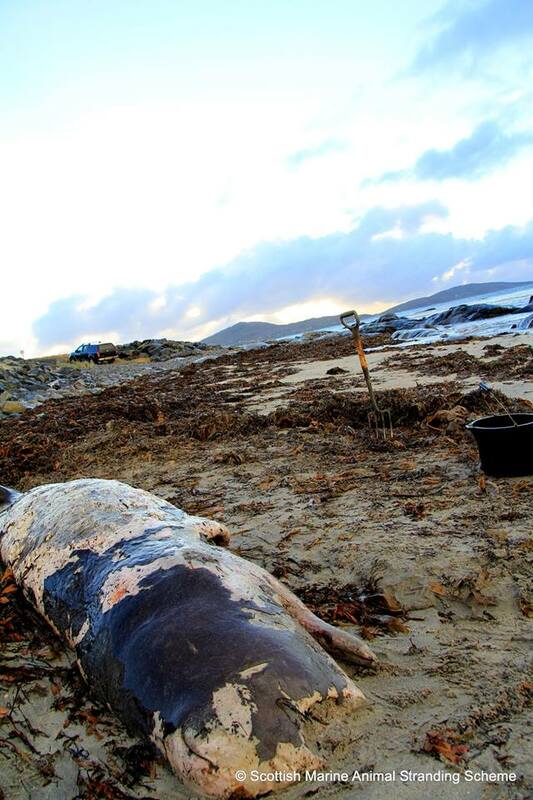 The organisation is still investigating the mysterious deaths of more than 80 beaked whales – species which usually live thousands of feet under the sea – that have washed up on Scottish and Irish shorelines since August. The newborn sperm whale’s skeleton has been donated to the National Museums of Scotland.